UK based lighting specialist, Rako is showcasing its latest developments at ISE, which include LED Control via constant current and four-channel RGBW constant voltage LED drivers and a new range of wireless 16-scene dimmers with more scenes – which the company says are now even easier to install with their wall mounting brackets, single ended wiring and the simplified set-up button that eradicates the need to use a magnet. Rako is also offering an insight into its updated iPhone, iPad and Android App with a revised user interface, LED colour wheel, personalised room, scene and channel naming – with images. Rako is also highlighting its new blind and curtain range, offering roller blinds to roman blinds and delivering features such as precise alignment, positioned control, software configurable end-stop, programmable speed control and soft start/finish all with quiet motors. ISE visitors can also get information on a new patented NFC (Near Field Communication) wireless wallplate, which is programmable via a PC adaptor or smartphone. 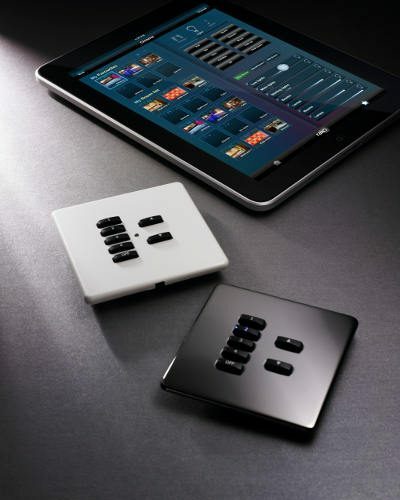 Rako says the ability to configure a wireless wallplate without the need to use physical connections or hard switches will promote more advanced programming than is otherwise possible, giving the installer the ability to individually address and map each button as well as assigning functions for both press and release actions. Rako will also show a programmable wireless volt free interface unit allowing the use of standard latching rocker switches, meaning standard accessories from any switch plate manufacturer can be used to link into a Rako wireless or wired control system ensuring that all electrical accessories match the design and décor of an installation.